Home Fashion White Blouse Can Create Magic To a Blue Saree Style! 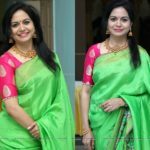 White Blouse Can Create Magic To a Blue Saree Style! What thoughts cross your mind, if we tell you to pair your royal blue saree with pink hem to pair it with a white blouse? May not so sweet to hear, in fact it might make you picture a bland saree look. However, in reality, it will make for a majestic saree style. 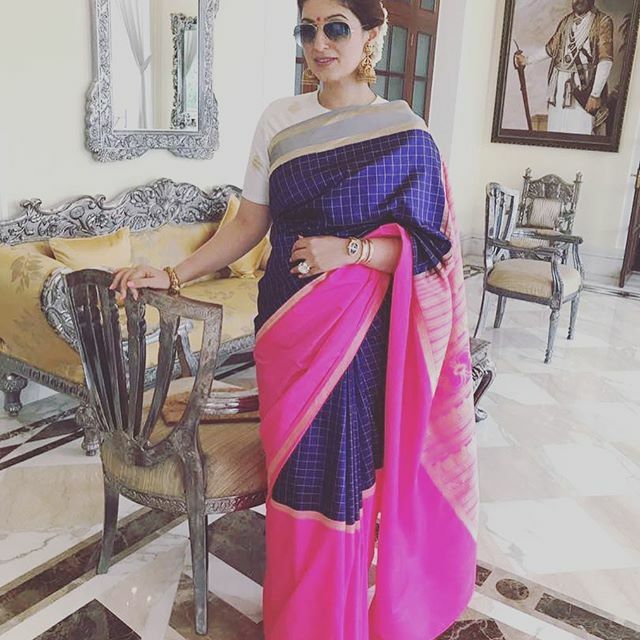 When Twinkle Khanna wore a gorgeous deep blue drape that is quite made to look spectacular with a bold fuchsia pink border, we know we are going to fall for it. The fact that the classy lady chose to wear this regal saree with a stand out high neck white blouse, proves how wrong to think that hues like white, off-white are not a thing to pair with darker colors like the one she wears here. With some bold antique jewellery and big bindi, Twinkle finished off her saree style. We are bookmarking this to try this color combinations for sure. Are you? 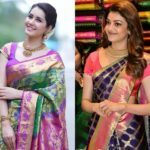 Previous articleHow To Make Your Half Saree Style Look Modern & Fun? Next articleHow Would You Make Your Denim Blue Saree Interesting?